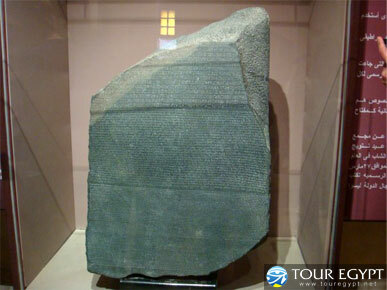 Closely associated with the town of Rosetta is the discovery of the Rosetta Stone. This great occurrence took place in the course of search by a French contingent during the French expedition to Egypt of a suitable site for fortifications. Dated 23.3.196 BC. The stone recorded a decree passed by the priests of Memphis in honor of Ptolemy Epipanes (r. 205 BC- 181 BC ) on the occasion of his accession and coronation, for his bounty to the temples and the priesthood. The stone was taken to Alexandria then to Cairo. However, following the defeat of the French fleet at the hands of the British in 1801 at Abu- Qeer, Alexandria, the Rosetta Stone was forfeited to the British, together with countless other treasures which formed the nucleus of the Egypt collection at the British Museum in London.As the original stone was moved to London, copies were sent to universities and research centers interested in Egyptology around the world. Jean- Francois Champollion was born in Figeac, south France on December 23, 1790. At the age of 18, Champollion was well-versed in Arabic, Calidonian, Syrianic and Coptic languages. Following in-depth examination of the Rosetta Stone, Champollion came to the conclusion that he had at hand one single text in three languages. Based on his profound knowledge of Coptic language, Champollion found out that there was one text , written once in hieroglyphics, a second time in demotic, and a third time in Greek. In order to get a first-hand experience of ancient Egyptian history, Champollion traveled to Egypt, where he visited ancient temples and tombs and copied inscriptions on the walls. On March 3, 1832, Champollion died, leaving behind a substantial dictionary of ancient Egyptian together with a grammar of the language. As a result of his work and continuing research, trained scholars can now read with ease hieroglyphic texts, that were before him , a closed mystery. Rosetta, with its strategic location between the Mediterranean and the western arm of the Nile, Rosetta had been an extremely important military site since early times. The town was witness to many important events in ancient as well as modern times. It is typically tranquil and highly green town with vast gardens, orchards and date-palm plantations , in addition to a multitude of beautiful historical houses, inns and mosques adorned with exquisite decorative inscriptions and woodworks. Lying 65 km east of Alexandria, Rosetta dates back to the Protodynastic era , where Menes marched from Upper Egypt to capture the town within his drive to unite both parts of the country and the town was then named " Khito". In the Ptolemic era, the town was renamed " Poulbotine" after the Poulbotinium Temple, dedicated to the worship of of Queen Cleopatra. In the Coptic age, the town was known as Rashit, later converted to Rashid. In later epochs, the town came to known by its present name of Rosetta ( rosy in Latin ). In 853 AD , the Abbasid Caliph ordered a town to be built on the site of the old town on Poulbotine as a protective fortification against sea invaders. Rashid was referred to in history books as famous for making salted fish and sea snails. In 1249, king Louis IX of France occupied the town, in the course of his crusade against the Orient. This incident drew the attention of the Mamelukes to its importance. As a result, they flocked into the town and many of them built beautiful houses, mosques, inns and public baths. Since then, the town was used as a trading harbor.The Mameluk Sultan Qunsuwa al- Ghouri built a castle and ordered many houses and mosques to be built there. Under Ottoman rule, Rosetta remained a prosperous trading harbor. At that time, the town attracted the attention of both Britain and France, being the major colonial powers that controlled trade between Europe and the East. They set their eyes on Rosetta as a foothold to possibly capture Egypt and France, appointed as a consul-general at the town Mr. Benoit De Mallet, an encyclopedic, enlightened French scholar, known for his mastery of Arabic. Mr. Mallet had lived in Rosetta fort 16 years , where he wrote one of the best-known classics "Description of Egypt". At the same time, Britain was also looking for a foothold on the Mediterranean in order to protect its trade route for coffee shipped from Yemen, then a British protectorate to Europe across the Red Sea and the Mediterranean via Suez and Cairo. As a result, Rosetta turned into one of the most flourishing Mediterranean harbors. Its warehouses were replete with grains, coffee, silk and many other trading commodities. Its warehouses were replete with grains, coffee, silk and many other trading commodities and its streets bustling with Armenian, Turkish, Syrian and Jewish traders. Rich merchants and consuls of European countries, in addition to hotels, inns, mosques and churches, built many elegant houses. During the French expedition, General Mineau was appointed ruler of Rosetta, where he stayed for one year, embraced Islam and took a wife; Zobayda al- Bawab. As Mohammad Ali took over in 1805, Rosetta gained more importance as a town and trading harbor. The town itself is an open museum, with 22 monumental residences dating back to the Ottoman era in addition to 12 mosques, mills, castles and public baths. 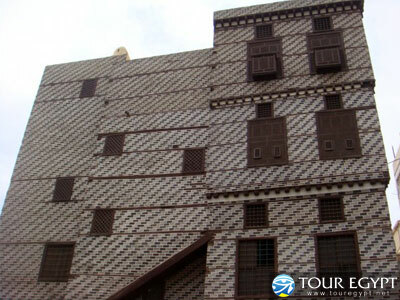 In no other town in Egypt there can found such unique collection of monumental residences, built with a rare type of brown, well-trimmed and pointed bricks. How these bricks were made still remains a mystery. The houses reflect a high style of architecture, construction and carpentry. Designed to Islamic architectural style, the houses comprise Mushrabiyyas ( oriels), vast reception rooms, decoratives, in-laid sea shell woodworks, domes and densely ornamented doors. Houses were provided with fresh water tanks, properly insulated to protect buildings against water leakage. Normally, each house had a drinking fountain ( Sabeel), made available for free to passers-by. The interior of the house was rich with exquisite decorations, including inscriptions in Kufic calligraphy. Mushrabiyyas were made of geometrically shaped, fine woodworks. On top of the house, which sometimes rose to two floors, there was a decorative skylight to allow natural light and air into the building. Rosetta commands a special significance in Egypts modern history. On March 31, 1807, it was the theatre of a crucial battle between local inhabitants led by the towns ruler; Ali Bey as- Slanki on the one hand and British forces led by General Fraser, who sought to capture the town as spring board for invading Egypt. As the British marched from Alexandria, Egyptian fierce resistance, leading to the defeat of the British troops and death of the British commander, surprised them. Later a treaty was signed by both parties, whereby the British troops evacuated the town. One of the outstanding landmarks of Rosetta is Abu Madour Tower, wherefrom Vivien Dinon, a major historian of the French Expedition monitored the famous Abu-Qeer naval battle between the British and French fleets. Lying under the jurisdiction of al-Behaira Gvernorate, Rosetta now covers an area of about 92 sq. km, with a population of about 163,000. The town has also an efficient infrastructure, stations, regional and international telecommunications besides an overland and river transport network that link it with other parts of the country. Today, as a tourist attraction, it is best known for its distinct Ottoman era merchant houses, of which there are around 22. Most are being restored, but a few are open for visitors. With many mashrabiyyas, the intricately carved wooden screens, the houses are usually three stories with each level stuck slightly out from the lower ones. The facades are relatively narrow, and the mortar is often outlined to create polychrome patterning in red, black and white. There is suppose to be a museum which occupies the House of Arab Kily where the governor resided during Rosetta's better days. 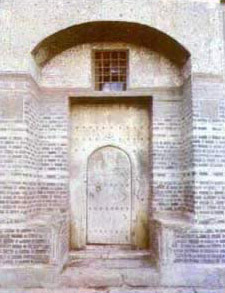 Also of interest is the Hammam Azouz, which is a two story, public bath.